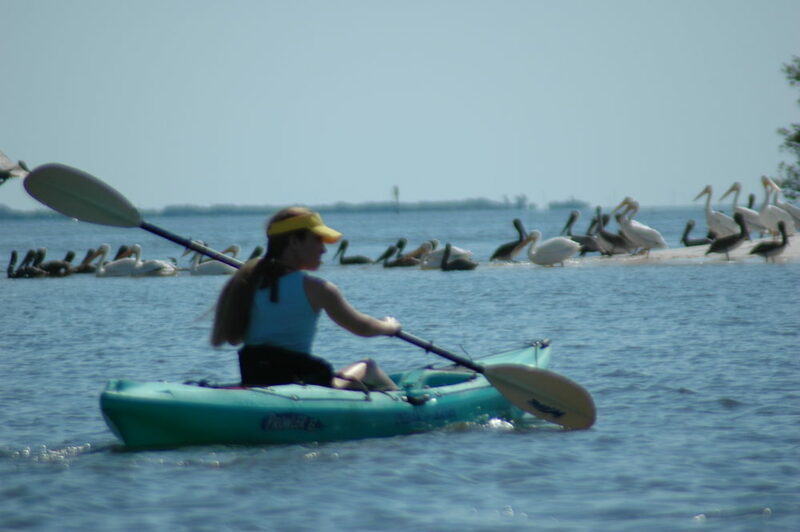 The Cedar Keys are situated in the remote, Big Bend region of Florida’s west coast, where flat terrain makes the transition from land to sea is as subtle as a Gulf coast sunset. For west-bound travelers heading to the Cedar Keys, the drop in elevation is so slight (about one foot per mile) gives little indication that they are approaching the coast. 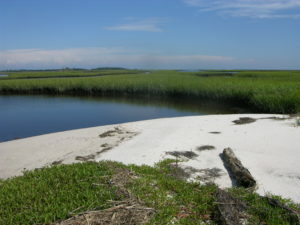 Slowly, sandy pinelands give way to swamps and marshes. Except for occasional scrub-covered ridges (formed on ancient sand dunes), it is a sodden land where wildlife abounds and human habitation is sparse. As land meets the sea, the low ground becomes inundated by water, and higher ridges form myriad small islands. It’s an area of constant change, tides rise and fall, the shore line surges in and out. A boat left at the waters edge may, within a few hours, be sitting a hundred yards inland. Unfortunately, the opposite is also true. Local lore is rich in tales of people being stranded when rising tides had carried away their vessel. In the “tidal zone,” between high and low tides, a fascinating ecosystem thrives, fueled by a bounty of marine life that washes ashore with the rising tide and is left stranded in tidal pools as the water line recedes. Here, in the salt marshes and mangrove swamps, you’ll find animals such as fiddler crabs. When you see these comical little guys sitting near their burrow, waving one huge claw as an enticement to passing females, you’ll understand how they got their name. 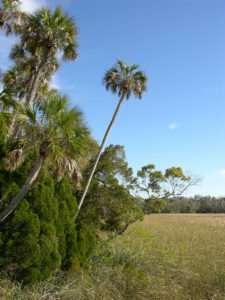 On the larger islands, pines, cabbage palms, mangroves, red bay, laurel oak and live oak dominate the over story, while at their feet, dense thickets of hardy plants and shrubs, such as Spanish bayonet, salt bush, wild olive, yaupon, red cedar, palmetto and prickly pear cactus can make hiking difficult. On smaller islands, vegetation is more sparse, ranging from those with just a few ground-clinging grasses, to slightly larger ones sea purslane, Christmas berry and mangroves might add more variety. Most of our trips start at Shell Mound, a 2000 year old Indian shell midden. From there, we make our way out to a few of the many barrier islands that line the coast around Cedar Key. We get out and stretch on a couple of the islands, taking lunch and checking out some of the wildlife before making our way back to the boat ramp. Nearly 2,000 years ago, Florida’s changing landscape coupled with the dynamics of interacting native populations prompted some aboriginal tribes to move to the Cedar Key area. With abundant sea food, settlements thrived until the early 1400’s (before the arrival of Europeans). Evidence of this long occupation is most noticeable in the numerous shell mounds that dot the coast, not only here but all along Florida’s Gulf coast. 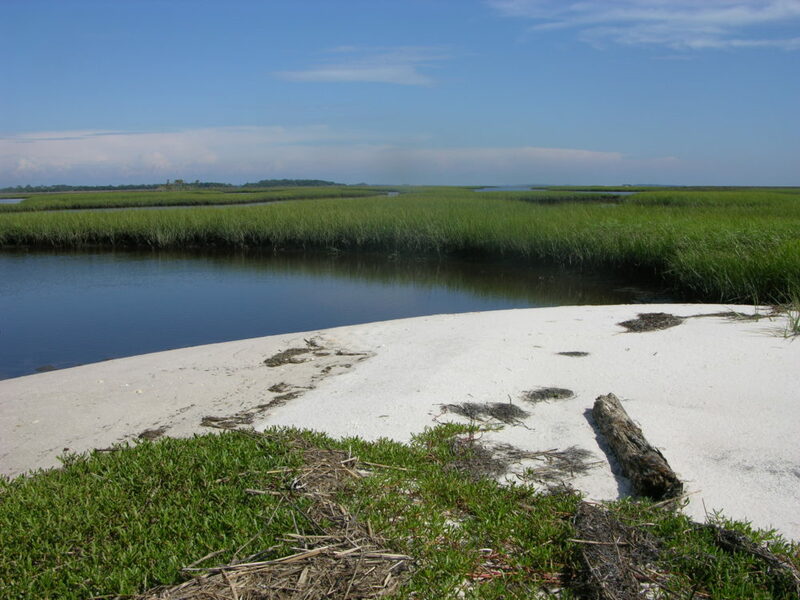 One of the largest of these middens (large mounds of discarded shells, pottery and broken tools) is located a little north of the town of Cedar Key. You can see this mound at Shell Mound County Park, where many of our paddle explorations begin. During the Second Seminole War (1835 – ’42) Seahorse Key, near Cedar Key, was the location of a military hospital and a detention center where Indians were kept before being shipped west to the Indian Territories. 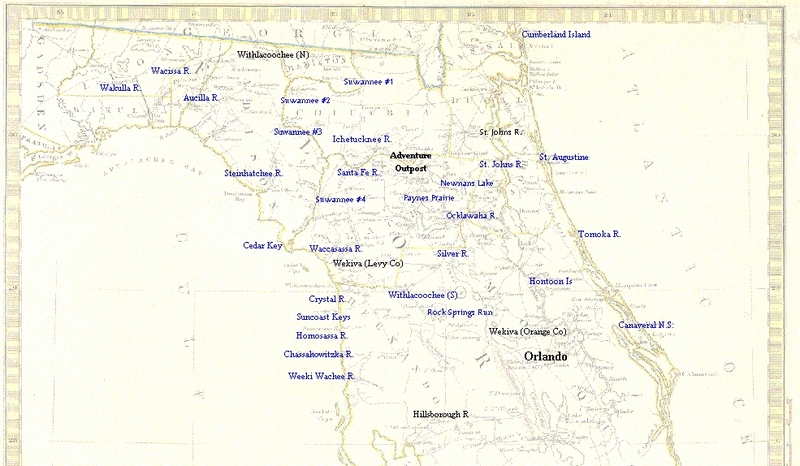 After Florida became a State, the U.S government built a lighthouse on the island. Later, during the Civil War, it was used by the Union Army as a military prison. 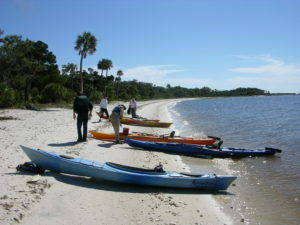 On nearby Atsena Otie island, the army built a supply depot during the Second Seminole War. Over a century later, in the wake of the Civil War, a large mill was built on the island, where much of the area’s vast stands of cedar trees were buzzed into pencils and shipped to distant ports. The town’s population grew to nearly 300 before the mill was shut down and a hurricane destroyed most of the homes. On days when our journey brings us to this little island, we enjoy a nice hike to the old grave yard where we find the graves of some notable characters including a pirates family, politicians and mill workers. On other days we head for a different island where we explore an old home site, abandoned early in the 1900’s, where we learn about many of the local wild plants and how they were used by the Indians and settlers. The real stars of the island community are the birds. Numerous species, some resident and others migratory, can be found here. 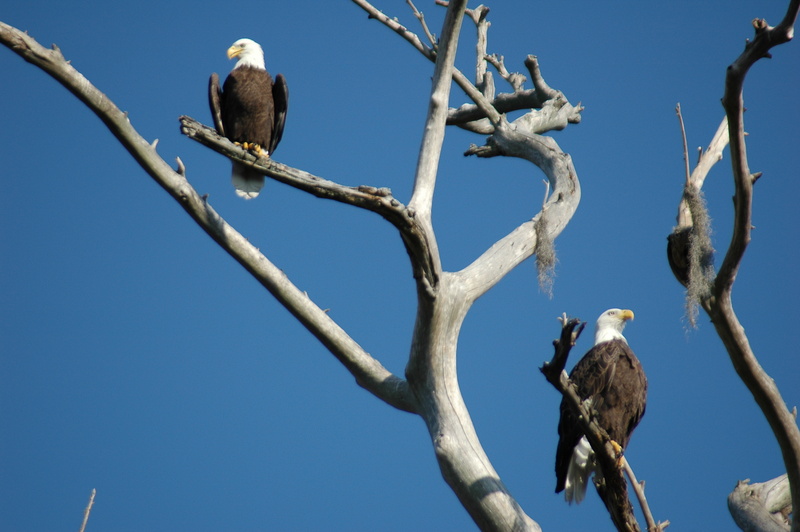 The more commonly seen birds are terns, gulls, sandpipers, ibis, cormorants, oyster catchers, pelicans and osprey. Most of these islands are part of the Cedar Keys National Wildlife Refuge, where thousands of water birds nest each year. Nesting or not, there are always plenty around. We often spot dolphins as we skim between islands. Less frequently, we’ll happen upon one of the wonderful gentle giants of these waters, a manatee. Beachcombing for shells and other interesting gifts of the sea is a nice change of pace from our inland excursions. On the islands, we often find broken bits of pottery (shards) that remind us of a time when sea levels were much lower and the shore line was many miles out. Also of interest are scores of horseshoe crab shells on the beaches. These are among the oldest animals on earth, claiming an ancestry dating back nearly 550 million years. Millions of years before dinosaurs, these relatives of spiders (not crabs) looked exactly the same as they do today. Their secret to success? Perhaps it’s their two sets of eyes, or the ‘jaws’ in their legs that require them to walk when they eat (the original multi-taskers!). Maybe it’s their blue blood (a result of having a copper basis in respiratory pigments rather than iron) which has some poison neutralizing properties, and sells for $15,000 per quart! Birds love eating them, but not humans – though they aren’t poisonous. Indians used to eat the muscle in the abdomen which moves the tail (telson). At first glance, the telson looks like a dangerous spike, but in reality, it is used to help the animal turn over when it gets flipped onto it’s back (turtles could use such a tool!). The telson’s lethal appearance wasn’t lost on the Indians who used them for spear points. They also used the shells as scoops to bail water from their canoes. Their large eyes and optic nerves have made horseshoe crabs popular for eye research. When mating, the female carries a male (sometimes several) on her back onto the beach. She digs a hole, deposits thousands of tiny eggs, then drags the male over the eggs for him to fertilize them. That’s not the only time they’re used as fertilizers. Some farmers continue the old practice of tilling horseshoe crabs into the soil before planting.